The heyday of the BBC loudspeaker research program was drawing to a close in 1983 when the original LS5/9 was developed. The LS5/9 and its larger brother the LS5/8 were really the last of the products one might think of as BBC monitors in the traditional sense. (The later LS5/12 was a different sort of transducer, and not really a creation of the Kingswood Warren group.) Things were changing at the BBC. Thatcher-esque austerity would soon shut down its speaker research program, and, in another direction, the BBC was having to deal with the monitoring of rock music—rather reluctantly, one supposes. The LS5/8 was explicitly intended, it seems, to meet the need for a monitor speaker that would play loudly. The LS5/9 is a much smaller unit—only a one-cubic-foot cabinet—but it too was expected to produce considerable sound pressure levels. But despite the additional requirement of playing louder, the LS5/9 remained true to the classic BBC principles of damped thin-wall cabinet construction and crossover circuitry that controlled the frequency response very carefully. The LS5/9 was not quite the commercial success that earlier BBC-related models like the Spendor BC1 (which was the moral equivalent of the BBC’s LS3/6) or the LS3/5a had been. For one thing, the BBC’s ideas had become quite widespread, and accurate, flat, two-way “monitor” speakers from other sources had become widely available. There was more competition than the BC1 had seen in 1968, when it was practically the only low-coloration box monitor available. Spendor and Harbeth kept the BBC tradition alive (at one remove) after the closing of the BBC research department. And though the BBC continued, and continues to this day, to issue licenses for manufacturers who wish to bring out BBC designs, they were almost all LS3/5a clones. Recently, this has changed. Stirling Broadcast and now Graham Audio have taken up the manufacturing of licensed models other than the LS3/5a. Stirling has the LS3/6 (as well as its own version of the LS3/5a), and Graham has undertaken to reintroduce the LS5/8 and the LS5/9 (and I suppose almost inevitably its own version of the LS3/5a). These are all BBC-licensed models, meeting the original specifications, although in most cases with different drivers than those in the originals. We are now enjoying an embarrassment of BBC riches! This is a delightful thing, no doubt, for people like me, who admire the BBC tradition enormously, but it does present a bit of a conundrum to the potential purchaser. Which BBC speaker should he buy? 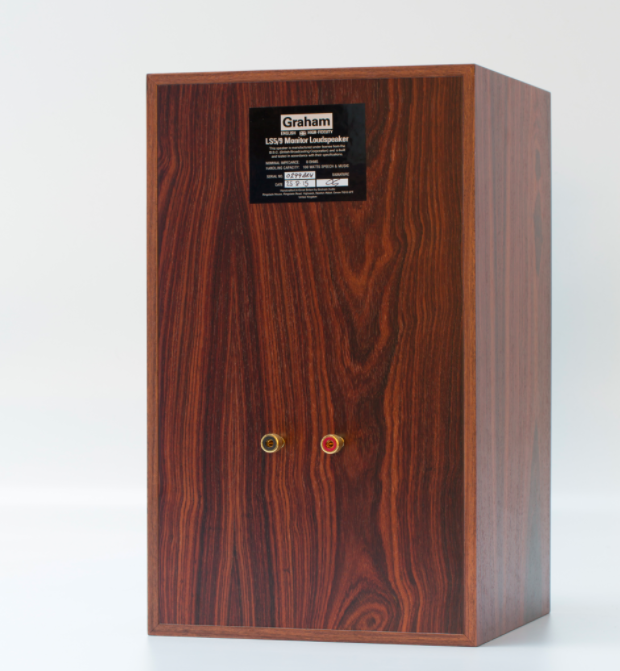 The Graham Audio LS5/9 is BBC-licensed—certified to meet the specifications of the original design from decades ago. Moreover, it is engineered by Derek Hughes, a distinguished designer in his own right and also son of the founder (with his wife, Derek’s mother) of Spendor and a member of the original BBC research team. We have here not only an officially licensed BBC monitor designed by a true expert, but a design with a family connection to the early days of BBC research. The BBC speaker research program had a number of unique features. One was the vastness of the resources on offer. In pre-austerity days, government money generated an environment where investigations could be carried out almost without financial restraint. The number of talented and dedicated people involved and the facilities they had on tap were unparalleled before or afterward. A second feature of the situation was the unique opportunity to judge the sound of loudspeakers against the sound of actual music. No vague feelings about how a speaker compared to some indefinite memory of music were to be taken seriously. Live music was constantly available for direct comparison—control room versus the actual sound. In this context, colorations of great subtlety could be and were detected. The BBC speaker research team wanted to develop speakers that would tell them the real and exact truth about what was being recorded, about what the microphone feed really sounded like. With good recording technique, this was expected to be the sound of live music itself. The absolute sound, indeed, was the goal. Rather curiously, while this was very much the same goal declared by The Absolute Sound at its founding, TAS in fact emphasized another aspect of the sound—not so much exactly what the music sounded like but more how it was arranged in space. Nominally, of course, TAS was interested in both—in “the sound of real music in real space”—but in practice it was the second half of the equation (the “real space” part) that came to the fore. And audiophiles in those heady early days tended to embrace openness and “soundstage” at the expense of ignoring colorations—American audiophiles, anyway (the British continued to be interested in minimal coloration for a long time). Consider if you will the Dahlquist DQ-10, one of the darlings of early high end in the 1970s and early 1980s. This was in fact a really bad speaker for sounding like actual music. In the early 80s I was carrying around a record of myself playing a G major scale starting on the bottom note of the violin and going up three octaves. I had pauses between the notes of the same length as the notes themselves, which were held for a good bit so I could play the record back and fill in the pauses with the same notes played live. Differences would stick out like sore thumbs. Failure to reproduce the characteristic timbres of each note (each note was different, of course, violins being as they are) was really obvious. On the Spendor BC1, with its BBC connection (effectively the same design as the BBC LS3/6), the match of each pair of notes was very good. One heard not just characteristic timbres correctly but the specific timbre of the violin involved, note for note. It was quite startling how well this worked. But with the Dahlquists—disaster! One could hardly recognize the violin timbre at all, even in the generic sense. The results were downright embarrassing. How could this have been, when the Dahlquists were reviewers’ darlings and the speakers of choice of a large portion of the American audiophile community? I think the answer is mostly that people either did not know or simply did not care. It is easy not to know—if one does not compare to live sound directly, colorations are much much less obvious than they are if one does compare. The point here is that the BBC designers compared all the time. They worked with this type of thing on a daily basis. Commercial speaker designers seldom did this, and indeed really could not do it to the same extent. Most commercial speaker designers did not have orchestras in residence! And they still don’t. The ghost of this variability continues to haunt audio. Go around a show with a single recording. How it sounds will vary all over the place as one travels from exhibit to exhibit. Basically, most of the presentations are quite wrong. BBC speakers were pre-checked to ensure they were close to right (or not very much wrong). No one can make a speaker that is exactly right. (The threshold for detecting differences is extremely low—a 0.1dB change in frequency response is audible, not to mention various other things that can affect the sound.) But the BBC speakers were carefully checked against live sound to come as close to it as could be arranged, due allowance being made for the microphone technique and so on. Indeed, the whole point of a monitor speaker is to allow one to check on the accuracy of the recording process—to check on the microphones and the rest of the chain. The speakers are supposed to be leaving all that alone. This sounds a bit negative as a goal but in fact it is a worthy and important one. Moreover, many speakers are in fact quite bad in a comparison to live music and in providing information about the behavior of the chain up to the speakers. This was true then, and it remains true now, albeit to a lesser extent. (Improvements in driver technology have brought things to a better state, although nothing like perfection.) The high-end woods are still full of speakers that do peculiar and outrageous things to the sound. Does this matter? It is surely audible. Do you care? Apparently quite a few people do not. In fact, it is relatively rare nowadays to read a review that talks about how a speaker actually sounds. As long as the balance is not totally outrageous—and often enough even when it is—the reviewer soon starts to talk about space, and detail, and hearing this that or the other micro-thing. The way the speaker actually sounds in the sense I am discussing is seldom mentioned. People say that the speaker is “neutral” and move on. But of course hardly any of them are anywhere close to neutral in this compared-to-live sense. I do not know if you care. But if you do—well, you are probably already a BBC heritage enthusiast. If so, read on. If not, I hope you will read on anyway—maybe I can convert you.